Mirror, Mirror, on the Wall, which Nation Has the Most Total Freedom of All? Libertarians are sometimes described as people who don’t want the government to interfere in either the bedroom or boardroom, which is a shorthand way of saying that there should be both personal freedom and economic freedom. Based on this preference for liberty and a desire to avoid government coercion, what’s the most libertarian nation in the world? Is it Australia, which I recommended as the best option for escaping Americans if the U.S. becomes a failed welfare state? Not quite. According to the new Human Freedom Index, Australia gets a very good score, but the most libertarian-oriented place in the world isn’t even a country. It’s Hong Kong, a “special administrative region” of China. Hong Kong earns its high score thank to it’s number-one status for economic freedom, combined with a top-20 score for personal freedom. For what it’s worth, European nations dominate the rankings. Other than top-rated Hong Kong, New Zealand (#3), Canada (tied for #6), and Australia (tied for #6), every single nation in the top 20 is from the other side of the Atlantic. So kudos to our friends from across the ocean. Most of them have big welfare states, but at least they compensate with free market policy in other areas, along with lots of personal freedom. And what about the United States? We’re ranked #23, which certainly is decent considering that there are 159 countries that are scored, but obviously not worthy of superlatives. The infographic below contains the specific scores for the United States. As you can see, our economic freedom score (7.75 out of 10) is worse – in absolute terms – than our personal freedom score (8.79 out of 10). 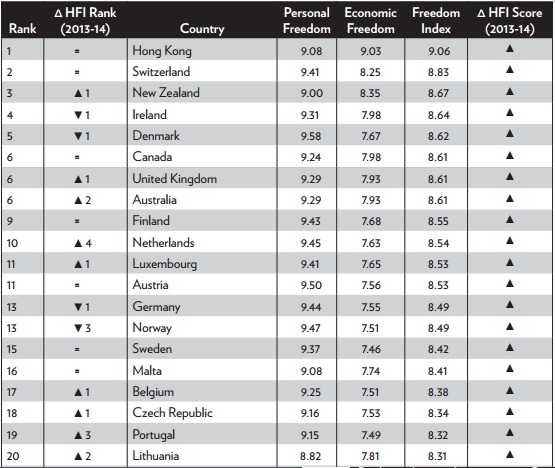 But since more nations (especially in Europe) get high scores for personal freedom, our relative ranking for economic freedom (16 our of 159) is better than our relative ranking for personal freedom (28 our of 159). 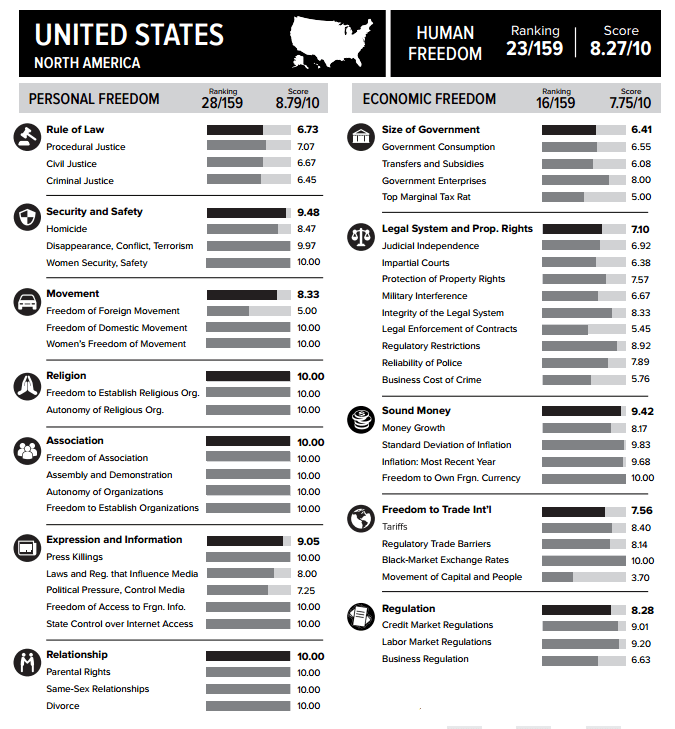 And if we look at the sub-categories for personal freedom on the left side, you’ll notice that America’s main problem is a very mediocre score for rule of law. Thanks, Obama! Let’s now look at the nations that have the most personal freedom. I already mentioned that the United States is in 28th place, so we obviously don’t show up on this top-20 list. 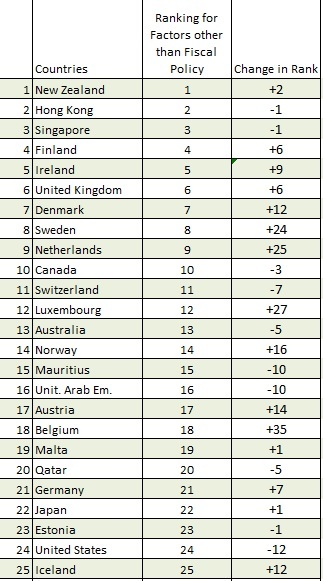 But you will find 17 European nations, along with Australia (tied for #12), Canada (#15), and Hong Kong (tied for #19). 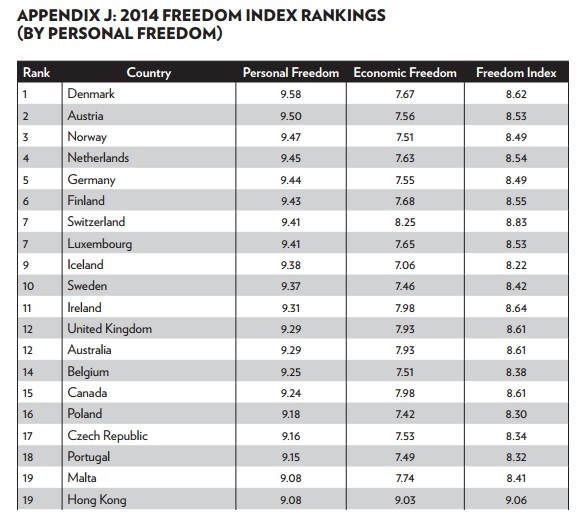 By the way, Switzerland is the only nation to be in the top 10 for both personal and economic freedom. So maybe that country’s improbable success isn’t so improbable after all. You do the right thing and you get good results. And honorable mention to Ireland, Australia, and the United Kingdom for just missing being in the top 10 in both categories. In case you’re wondering why Hong Kong had the highest overall score even though it was “only” #19 for personal freedom, the answer is that the jurisdiction scores so much higher for economic liberty than the European nations. P.S. For what it’s worth, I find it surprising that China, which ranks rather low for overall freedom (141 out of 159), is so tolerant of widespread freedom in Hong Kong. I assume (hope?) this is a positive sign that China will evolve in a positive direction. P.P.S. The very last country on the list is Libya, so perhaps we can conclude that the Hillary Clinton/Barack Obama intervention has not produced good results. Meanwhile, I’m guessing that the thugs in Caracas (154 out of 159) are happy that Venezuela isn’t in last place.